Type your GLS tracking number below, get live delivery information with our express tracking system. General Logistics Systems B.V., Amsterdam (GLS), is a Pan-European company providing reliable, high-quality parcel and express services as well as value-added logistics solutions. Through wholly owned and partner companies, the Group provides a network coverage of 42 European states and is globally connected via contractual agreements. Our system consists of 38 central transhipment points, 642 depots and 13,100 people. Some 17,100 vehicles are on route moving 363 million parcels annually for 220,000 customers throughout Europe. 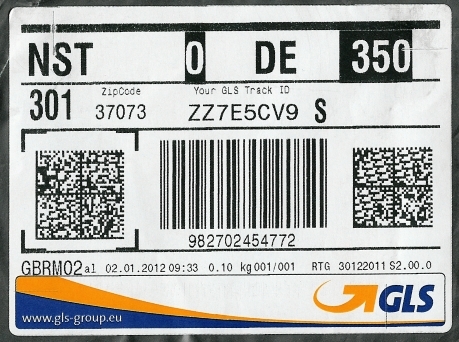 If you have problem with our express tracking system, please track your package directly on the GLS website. If you get no tracking information from GLS official website, you’d better contact them. If you have shipped through GLS, you will have received a copy of your Waybill. Each waybill has a distinct number which can vary between 10 to 12 digits(eg: 850360452, 781209907442). Here is a waybill sample which shows the GLS tracking number is 982702454772. Have no idea about GLS? Read GLS reviews in advance and write a review after sending your package with General Logistics Systems. If you have problem with our GLS Tracking system, submit your problem here, we will help you as soon as possible. Declare: We can NOT contact carrier or others on your behalf, we can only help you track your package with your GLS tracking number on official tracking system.